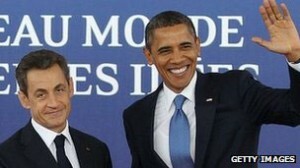 “I can’t stand him any more, he’s a liar,” Mr Sarkozy said in French. “You may be sick of him, but me, I have to deal with him every day,” Mr Obama replied. The remarks – during a private conversation – were overheard by a few journalists last week but were not initially reported, the BBC’s Christian Fraser in Paris says. For several days there was media silence in France about the exchange – a decision had been taken not to embarrass the French president, our correspondent says.